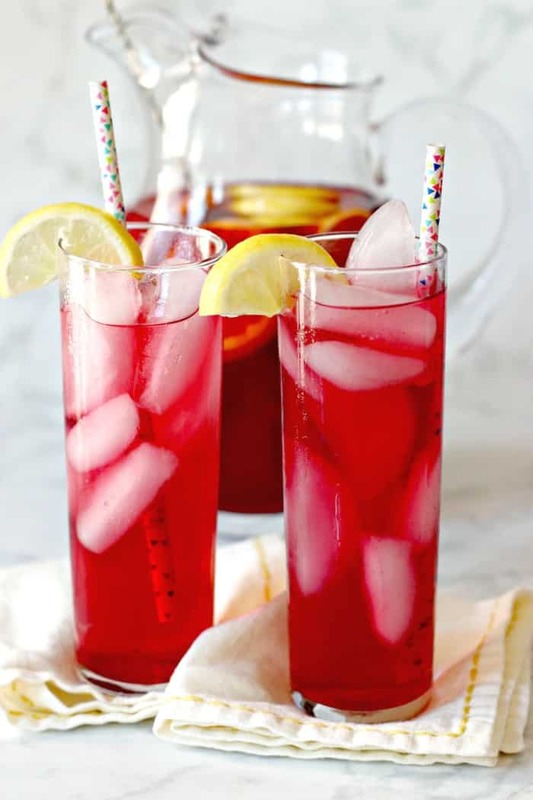 Spiked Iced Tea is the perfect beverage for summer entertaining. It’s easy to make with only a few ingredients. And using a basic formula it can be made with any of your favorite flavors. When it comes to summer cocktails, fruity flavors are my favorite. Some of my standbys are Easy Berry Vodka Cocktails, Fresh Pineapple Mojitos, and Sparking Watermelon Agua Frescas. 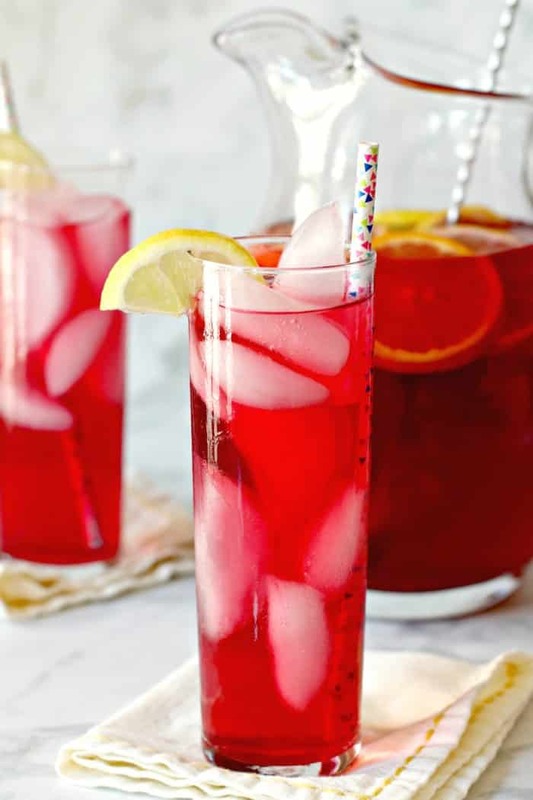 But when I’m serving a crowd, I love making refreshing Spiked Iced Tea by the pitcher. Not only is it easy to make with only a few ingredients, you can mix it up by combining your favorite tea flavors and spirits. It will come as no surprise that tea cocktails start with tea. 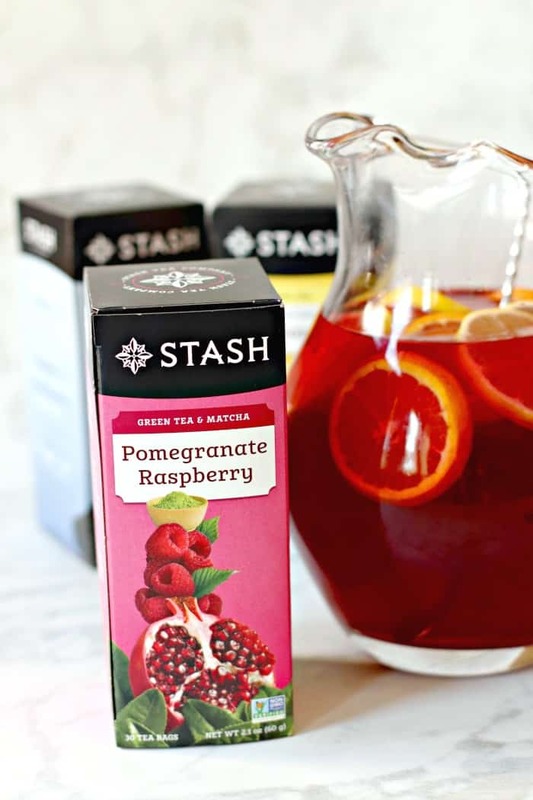 This recipe is my entry into the entertaining category of the Stash Tea Blogger Recipe Challenge. I received boxes of their 30-count Chamomile, Earl Grey, and Pomegranate Raspberry to assist in developing my recipe. While I decided to use the Green Tea & Matcha Pomegranate Raspberry for my Spiked Iced Tea Cocktails, I also experimented with the other flavors and developed some tasty beverages using the same procedure. Stash has always been one of my favorite tea companies. I love their unique flavors and products. If you would like to order their tea or gifts, including some web-exclusive flavors, you can enter the promo code VEGGIESSAVETHEDAY-SC for a discount at the Stash Tea online store. And now that we have the main ingredient for our spiked sweet tea, let’s learn how to make it. Making Spiked Iced Tea is quick and easy. Start off by steeping 12 tea bags for about 10 minutes in 4 cups of boiling water. I like to use a pour saucepan to make it easier to later transfer the tea to a pitcher. After the tea is ready, carefully remove and discard the tea bags. A skimmer makes this easy to do. Then add some sugar or your preferred sweetener and stir until dissolved. For this hard iced tea recipe which serves at least 10 people, I use 1/2 cup of sugar. But feel free to adjust this amount based on your personal preference. Next add 4 cups of cold water, then carefully transfer the tea to a serving pitcher. Stir in your alcohol of choice, and chill the tea until ready to serve. These cocktails are best served in tall glasses with lots of ice. Be sure to put the ice cubes in the glasses rather than the pitcher so that the spiked tea doesn’t become diluted. What alcohol is good in tea? The most common spirit choices for spiked tea are vodka, rum, and bourbon. Since I have a preference for tropical drinks, I usually go with one of the first two choices. For this recipe, I chose rum. But if I were making Spiked Iced Tea with Chamomile, I would go with vodka and a lot of fresh lemon, like a spiked Arnold Palmer. And Earl Grey and other black teas are wonderful with bourbon. The bottom line is you can’t go wrong with mixing your favorite alcohol with sweet tea for a refreshing summer cocktail. Try serving Spiked Iced Tea at your next party or gathering. 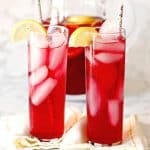 My favorite time to make a pitcher of hard iced tea is when I’m having a summer barbecue. I like to stir in some fruit before serving, such as fresh berries or sliced citrus fruit. Your friends will be impressed with how pretty it looks. And this beverage goes perfectly with all sorts of food from Guacamole Veggie Burgers and corn on the cob to Cauliflower Curry Grill Packets and Mediterranean Orzo Salad. And if not all of your guests drink alcohol, you can make a pitcher of sweet tea and let people mix in their own jigger of booze. Now let’s make Spiked Iced Tea! Spiked Iced Tea is the perfect beverage for summer entertaining. It's easy to make with only a few ingredients. And using a basic formula it can be made with any of your favorite flavors. Add the tea bags to a 2-quart or larger saucepan of boiling water and allow the tea to steep, covered, with the heat off, for 10 minutes. Carefully remove and discard the tea bags using a skimmer. Pour in the sugar and stir until dissolved. Add the cold water, then carefully transfer the iced tea to a pitcher. Refrigerate the iced tea until chilled and ready to serve. Before serving, add sliced citrus fruit to the pitcher, if desired. 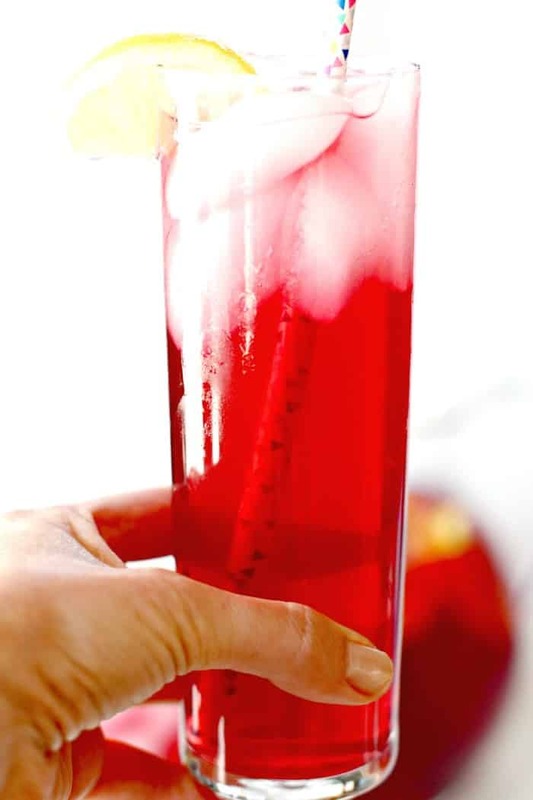 To serve, pour the spiked iced tea into tall glasses filled with ice and garnish with a lemon slice. The alcohol can also be served on the side to allow your guests to add it to their iced tea themselves. Allow 1.5 ounces per glass.